We are proud to have Joe Willie Totten join our staff at McCurry Motor Co. Joe Willie graduated Athens High School and then Athens State University with a Business Management Degree. Joe Willie is a long time Athens resident and will help us to continue serving the Athens Buy Here Pay Here market. He understands used car financing and is a welcome addition to our used car dealership. When lending money to people with bad credit for cars Joe Willie has the knowledgeable experience to help our customers get into a car loan that makes sense. Joe Willie can help you with all of your used car purchasing questions and needs! Call him today at 256-230-0006!!! Justin has been with McCurry Motors for almost 5 years and is our Manager at the Huntsville Al location. Justin has been in the buy here pay here business for several years and was in loss prevention previously. When lending money to people with bad credit for cars Justin has the knowledgeable experience to help our customers get into a car loan that makes sense. Justin can help you with all of your used car purchasing questions and needs! Michael has been with McCurry Motors for almost 11 years. Michael has extensive knowledge with all aspects of our business and has done everything from Branch Management to buying and repairing the vehicles. He has been working and or running the shop for almost this entire time.  He is one of the most knowledgeable service technicians in North Alabama and has an extremely experienced and knowledgeable team. 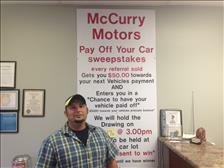 You can count on Michael and his crew to take care of you and your USED VEHICLE purchased at McCurry Motors. David is one of McCurry Motors leading Sales reps and has been with the company for several years. He has been more then 10 years experience in the industry and can help with all of your used car purchasing needs. Gary has been with McCurry Motors for just over a year but has already proved himself in this short time frame. If you are looking to purchase a used vehicle and need help with your financing it is almost a guarantee that Gary can help get you squared away. Give him a call today and drive off with your new vehicle. Mary is one of McCurry Motors most familiar faces. Mary works out of the front desk and wears many hats including office manager. She has been with us for almost 11 years! Mary is one of our customers favorite employees and will do her best to make sure you get taken care of! If you have any questions or need to make a payment give her a call at 256 230 0006 or send her an email. Josh Lawrence has been with the company for 10 years plus and has an extensive knowledge with both shop and branch operations. Josh handles the warranty claims and customer repair scheduling and concerns. 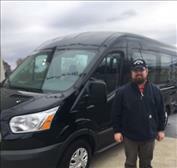 Josh understands the used car financing business and how to help keep Huntsville and Athens Buy Here Pay Here Customers rolling down the road. Feel free to contact Josh for your used car warranty needs at the Atrhens Al location 256-230-0006. McCurry Motors staff will work hard to offer the convenience of Buy Here Pay Here (BHPH) financing. Rather than finance your vehicle through a third party, such as a bank making monthly payments to a traditional lender, you make payments to us. We are an in house financing provider that specializes in getting good people with bad credit financing for a vehicle they want today. We supply a warranty and weekly bi-weekly or monthly payment options. If you have had a divorce, bankruptcy, repossession, or another life problem that has caused to be turned down at a traditional dealership give McCurry Motors a try. We sell used cars to people with bad credit as far away as Birmingham, Al as well as to people right around the block. Because we work directly with you, we can offer special rates and deals that banks can't. Come talk to us today to see how you can get a car you love, no matter how bad your credit score.We want your business!